Rated 5 out of 5 by Walker from Still as strong as ever After having a K1500 handed down to me when I started, I did the same when I got an apprentice. I have a brand new k1500 and its a dream. The original k1500 is still as strong as ever. It had a couple of minor repairs but nothing out of the ordinary (belts etc). Rated 1 out of 5 by kingsservices from They don't make them like they used to.. After waiting 2.5 months for the k-1500 sp-b to be shipped, we were very disappointed by the performance of this machine. We have used MANY drain cleaning machines before. Our 8 year old k-1500 drain cleaner had much more power than this. Problems: 1) The rear guide hose is too short. As we pull our snake back, we have to be very careful not to retract the snake fully. Otherwise, the snake would scratch floors/carpets at the other end of the hose. We have encountered many problems when working in tight areas where you have no choice but to retract the snake fully. 2) You can easily pull the snake out while running the machine. This is a major issue when you have the lever pulled down and you can still pull the snake forward. In commercial buildings that have long building drains, you will need to run your snake further than most residential homes. If you can easily pull the snake forward with the machine running (with the lever down), you can easily lose your snakes in the drain. 3) The k-1500 sp-b is rated to snake up to 30o feet. Both my business partner and I have noticed there is a lot less torque than our 8 year old k-1500 (snakes up to 200 feet max). The difference is very noticeable. 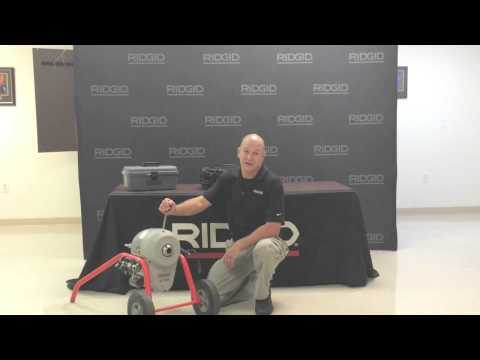 I would have recommended this machine in the past, but things have gone down hill with Ridgid. They just don't make them like they used to.